2014 ALA U.S. Spring Charity Seals, Sheet Collection, full sheets, VF, MNH. Issued 2014 by the American Lung Association (ALA). One sheet for four (4) of the (5) sheets of U.S. Spring Charity Seals issued in 2014. 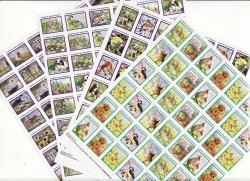 2014 ALA U.S. Spring Charity Seals, Sheet Collection, full sheets, VF, MNH. Issued 2014 by the American Lung Association (ALA). One sheet for four (4) of the (5) sheets of U.S. Spring Charity Seals issued in 2014. Collection is comprised of 2014-S1x, 2014-S3x, 2014-S4x, 2014-S5x. Missing from the collection is 2014-S2x, which because of cost, is available separately. This is an excellent and economical way to begin or enlarge a Spring Charity Seal sheet collection. Keep Your Lungs Healthy ... " on the reverse of all sheets. Issued 2014 by the American Lung Association (ALA). Dealer stock, not from a collection. Pristine, full brilliant colors, self adhesive, shipped flat.